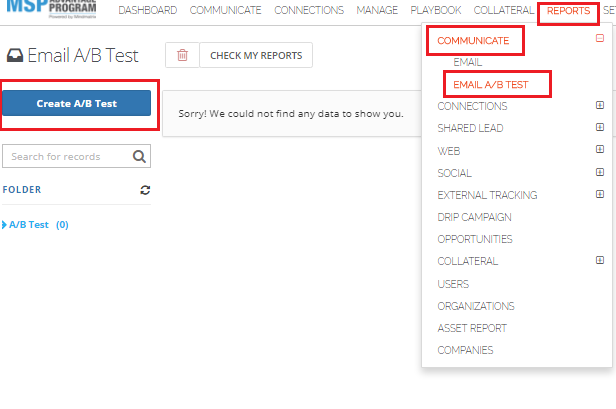 How do I create an email AB test? In an email AB test, a user sends off two versions of an email that have only one difference between them in order to test which version is more effective. To create an A/B test, go to "Reports" and then communicate, and then create an A/B test. Give your test a name, and choose a sample size. Then list that you want to draw from. Then click “Add Template” to select the templates that you wish to use. Use the preview button to make sure that you are satisfied with your template and choose the subject line for your templates, and then click “Start A/B Test”. In the A/B test section, you can track the progress of your texts.